KEY FEATURES: Shrub to 3m, with opposite heart-shaped unlobed leaves, 20x20cm, densely furry. Flowers in open terminal clusters ("pagoda-like"), red, with long backward-curved petals; and drooping stamens. 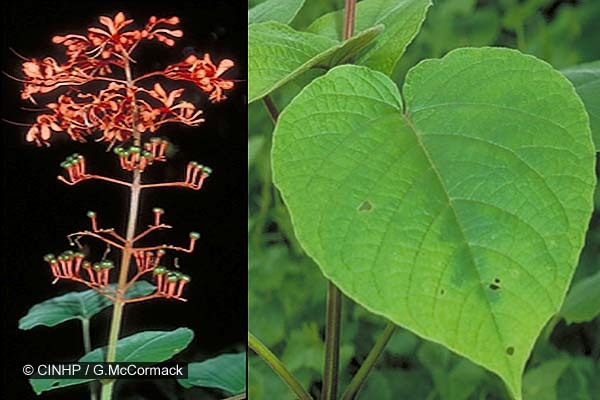 SIMILAR SPECIES: Clerodendron paniculatum differs in having leaves which are sharp-lobed and sparsely hairy, flowers which are star shaped with short petal-lobes, and stamens which extend straight out from the flower tube. NEGATIVE SIGNIFICANCE: Weed - moderate. Comments: A general weed of waste and fallow areas on the makatea islands.